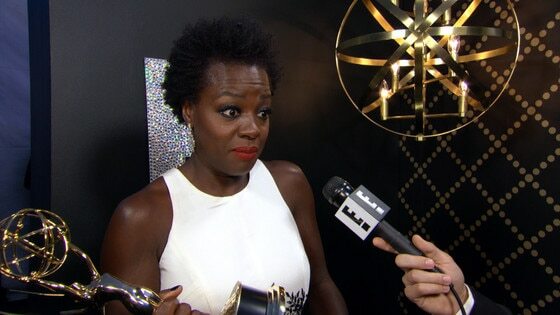 Viola Davis may be our favorite super woman on television and making history with Emmy Award-winning performances, but she is so much more heroic beyond the cameras and flashing lights of Hollywood. The 50-year-old actress got candid in her cover story with InStyle magazine, opening up about the things we don't see on TV: her marriage, motherhood and how she's learned to release herself from the fear of aging. We could all take a moment to hear her words of wisdom, which is why we're honestly a little envious of her daughter, Genesis, 4, who will receive that advice daily throughout her life. Davis adopted her daughter when she was just a baby in 2011, telling the magazine, "I always tell Genesis she was born from my heart, not my belly." The actress wants women to know that adopting is just as beautiful as birthing a child. "There are so many ways to mother rather than to carry a child in your body. So many children need parents, and so many of us want to mother. Know that you will experience motherhood to the full extent." Speaking of family, Davis also opens up about her 12-year marriage to Julius Tennon. "I've learned that it's not always about you," she explains of how they've made it work for so long. "Marriage is a dying to yourself, but [also this] renewing and being born into a state of commitment, of understanding the value of partnership in life." Although she's set aside selfishness and built a life based upon her partnership with her husband and raising their daughter, Davis says a lot of that learning came from self-understanding. In fact, that's one way in which, despite the constant pressures of Hollywood, she's gotten over her fear of aging. "What's released me most from the fear of aging is self-awareness," she tells the mag. "I've never determined my value based on my looks or anything physical. I've been through a lot in life, and what has gotten me through is strength of character and faith." Understanding her value has undoubtedly helped her in overcoming the limitations set forth in Hollywood for roles played by African-American women. However, that doesn't stop her from realizing their existence and hoping for a better future in the industry. "Unwritten racial casting rules absolutely still exist," she say. "I've played many best friends, crack-addicted mothers, next-door neighbors, or professionals with no personal lives. It goes back to perception. There is a limitation to how we are seen." Davis has certainly persevered beyond those limitations, making her mark on this world and becoming one of the most influential and acclaimed women in Hollywood. We can't wait to see what else she has in store for us in the future! For more from her InStyle interview, pick up the latest issue on stands today or headover to InStyle.com.